The Osborne hotel is set in the centre of an elegant Regency style crescent that was built in 1848. Commissioned by Sir Lawrence Palk, the handsome Grade II listed building, now known as Hesketh Crescent, took two years to construct and created 15 private terraced houses overlooking the stunning sea views of Meadfoot Beach in Torquay. The construction of the opulent 4-storey homes, designed by the Harvey brothers, was triggered by the expansion of the railway, which was predicted to bring an influx of visitors and tourists to the area. Indeed many people were attracted to the stunning location not just because of its accessibility but because of the mildness of its winters, the health-giving properties of the air and the unspoilt beauty of the scenery. The Crescent was leased to the architects from the outset, paying £1,000 for each house leased for 99 years and £6 per annum ground rent. The rich and famous came to live at Hesketh Crescent because of its growing reputation as ‘the Rivera of England’ – it was a relaxing spa town and a suitable place to convalesce. Charles Darwin lived at number 2 when he began writing his famous book on evolutionary theory ‘On the Origin of Species’ and engineer Isambard Kingdom Brunel spent his summers holidaying there. Philanthropist Angela Burdett-Coutts rented 1 Hesketh Crescent for twenty years and William Kitson, known as ‘the maker of Torquay’ worked tirelessly to transform the area into what the Western Morning News described as the “most opulent, the handsomest, and the most fashionable watering place in the British Isles”. Hesketh Crescent’s central house, situated at number 8, became the Osborne hotel in 1853. Later the hotel was expanded to occupy the five houses it consists of today and by the late 1920s the building had incorporated electric lighting, gas fires and lifts to all floors. Guests enjoyed tennis lawns and secluded sea bathing and by 1958 rooms with private bathrooms and toilets became available too. Today the Osborne is a 32-bedroom hotel that allows visitors to experience the spectacular views and historic beauty of South Devon in opulent surroundings. 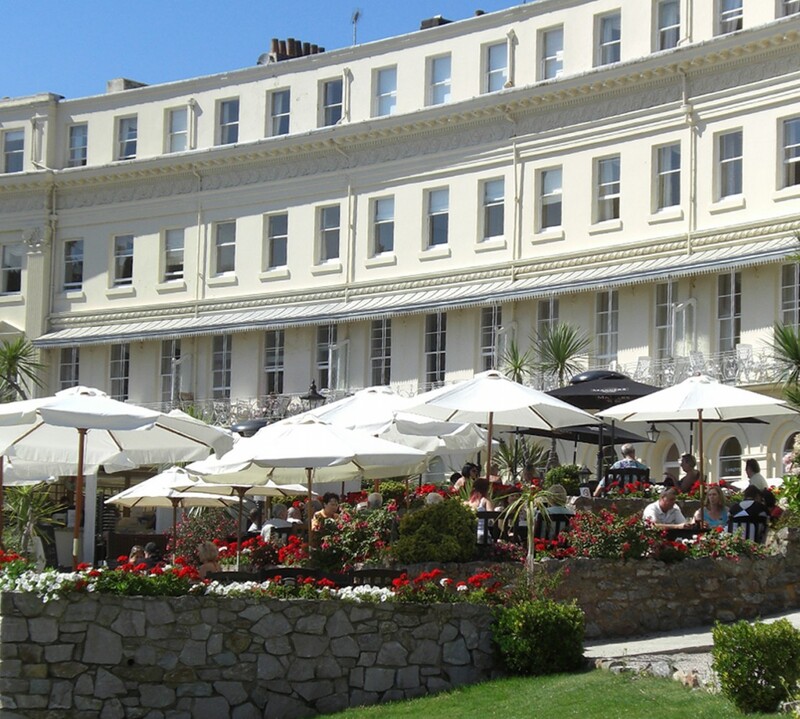 The Crescent has since been converted into a number of luxury timeshare apartments alongside the classically-styled hotel. The stately building and the trees that surround it fall under a Grade II listed preservation order to ensure the spa resort retains its historic character and beautiful design.